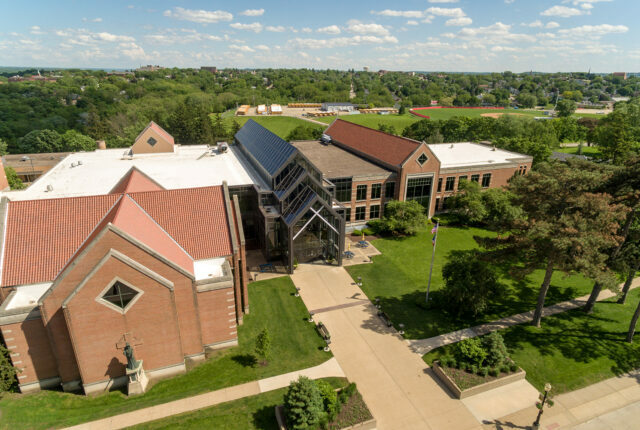 Aerial view of Clarke's campus including the Wahlert Atrium, Sacred Heart Chapel and Library. Clarke University is proud to announce that it has been recognized as a top-20 college in the Midwest as well as a top-10 Best Value School by the U.S. News and World Report “Best Colleges 2019” rankings. The 2019 rankings looked at more than 1,800 schools. U.S. News and World Report evaluates colleges and universities on hundreds of data points, using up to 16 measures of academic quality. The lists are released each fall as a way to assist students in the college search process. “The rankings confirm that Clarke offers a top-notch education within and beyond the classroom, one that is affordable and well worth the investment,” said Clarke Director of Admissions Jolene Christensen. For additional information, visit www.usnews.com.